Bursztyn was one of the shtetls in the Galician region. Its name means amber. It is located SE of Lvov. According to 'The Encyclopedia of Jewish Life Before & During the Holocaust', Bursztyn Jews probably arrived in the early 17th century. They enjoyed relatively secure conditions under the Polish Kingdom. The first shul was built in the mid 18th century. Due to the Austrian conquest in 1772, conditions worsened under heavy taxes and other disabilities but improved with the institution of Jewish equality and the development of the town in the second half of the 19th century. When the Jewish population rose to around 2,000 (50% of the total population) Hasidism and Haskala were well represented. At the end of the century, the Zionist movement began forming. In 1900, there were 1,216 Jews who lived there. Bursztyn is within Stanislawow which is now renamed Ivano-Franivsk. The town is currently part of the Ukraine. In the Sefer Bursztyn Yizkor Book, there is a brief summery written in English. Bursztyn was a typical townlet or shtetl, like hundreds of other tiny communities in Poland. The Bursztyn Jews were religious and their life centered around their synagogue. There were many scholars and men of intellect in Bursztyn. The education given was traditional. The boys were taught in a heder and afterwards, some continued their studies in a yeshiva. The girls learned prayers and some of them learned Hebrew and German or Polish lessons from the local teacher. Some young people were not satisfied with this way of life, in which they saw no future or chance of making a living in such a small town. They yearned for the opportunity to go out beyond their community. Both merchants and workers tried hard to make a living. The merchants traded with the Gentile farmers in the surrounding villages. While struggling for commercial success, they remained dedicated to their moral precepts. The Jews of Bursztyn were renowned for their hospitality. They gladly shared their meals with the hungry and poor wayfarers. They gave to the utmost of their ability to charitable causes and everyone was willing to help people in need. At the beginning of the twentieth century, the first library was established together with a Zionist organization. It was run by a group of progressive Zionist youth. The library became the center of their life. Newspapers in many languages including the Hebrew daily "Hatzfira" and the Hebrew weekly "Hamitzpa" were subscribed to by the organization. The young people longed for educational progress. Knihynicze is today a major town in the Ukraine, located 69 kilometers SE of L'vivat longitude 49° 23´ and latitude 24° 28´. 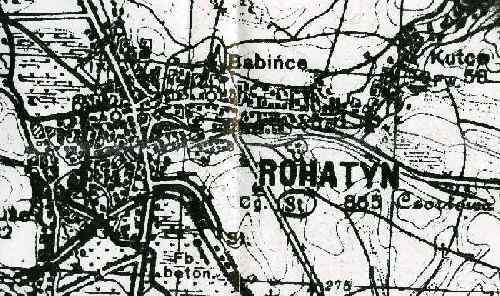 From 1792 until 1919 it was known as Knihynicze, in the Austrian province of Galicia , ....from 1919 until 1945 it was part of Poland .....and then it became Kynigynichi, part of the Ukraine, 7 miles East of the major city of Rohatyn (now Rogatin, Ukraine). There is a fabulous JewishGen Community page for Knihynicze which has links to area resources... Knyaginichi/Knihynicze>click here. We know a lot about Knihynicze mostly from the landsmanshaft that existed in New York City; these landsmanshaften were formed of folks who came from the same town or area, for social benefits, and they often purchased burial plots in the nearby cemeteries. In 2011 I spoke to the last President of the Knihyniczer Society in New York. His name is Irving Bussgang. The Jews from Knihynicze must have been an organized and fervent group. The primary Landsmanshaften organization was founded in the late 1800s in New York City and called the First Consolidated Kinheniczer Reverand Jehuda Arje Sick & Benevolent Association Inc. The following are the details and we want to add the founding officers. Jewish Records Indexing-Poland A wonderful collection of vital record indexes available from the AGAD archives in Warsaw; online at https://www.JewishGen.org/JRI-PL/jriplweb.htm. Over 500 vital records from 1859-1898...and the Index is available on the Internet! Just key in your surname or just key in the town Knihynicze! Thanks to Stephen Morse's wonderful Ellis Island Front End, where one can query the Hebrew immigrants by town, I have assembled a list of over 350 Hebrew immigrants to Knihynichi. There were thousands of other Hebrew immigrants from Knihynichi, at different times, and to different ports of entry; and many names may not appear if the passenger list did not contain "Knihynicze" and "Hebrew" recognizable to the interpreter. It is fascinating to observe the different spellings of the town and the surnames. Just as a reminder, Knihynicze was part of the Austrian Empire (an imperial Krownland of Galicia) from 1776 to 1919; then it became part of Poland. In the 1940s the area was ceded to the Ukraine, where it remains today as the city of Kny??. This might explain some of the different nationalities we find below. I wouldn't take the ages at their listed value either. Keep in mind that there were different tariffs for children.